This great work and the Epistle to the King are important texts that I translate here complete with Sixteenth Century warts and all. Hopefully I haven’t added any more small blemishes to that antique collection; please persevere. These epistles bear a similar relationship to the Nostradamus Quatrains overall as that which any whole-hexagram commentary bears to its selected line in the ancient Chinese Book of Changes, the I Ching. The former may reveal the backgrounds to the eccentric wordings of the latter but truly the thrust is in the lines/in the quatrains. on his outstandingly utile website. It carries a different translation to my own. CONTEXT: This is the Preface, dedicated to Cesar, attaching to the very first Edition of the Centuries published in 1555. Wishing you a lifetime of felicitations. Your late appearance, Cesar Nostradame my son, has made me, for thee, reduce to a memory my long times alone in continuous night vigils noting down by hand what the aetheric divine one gave me an understanding of, via Astronomy’s periodic cycles, to the common benefit of humanity after the bodily expiration of your father. Nostredame ties, irrevocably, the Divine to his Astrology. Translation note: as used in scholastic philosophy, ‘naturelle lumière’ or natural light is of the intellect and the senses but could mean, to an astrologue, the diffuse solar light over the ecliptic plane whilst ‘terreine plaige’ might mean, to a religeuse, an ‘Earthly covenance’. That there is an expression ‘à contre-lumière’ or ‘anti-light’ perhaps reflects the special importance of light and dark in the Roman Christian World. There was a Medieval belief that humans by self improvements could transform themselves into light beings, the Serapha. ‘Lumière’ may also refer to Lucifer or the planet Venus. and do not want to speak of thy years, which are not yet strung together, rather of your brave months of struggle unsuited to taking in with your dim ken what a force I will become after my designated days are drawn: would that it were not impossible to put to thee by writing that which will have become obliterated by the affronts of time: as the parlance of mystical prediction, transmitted down the ages (the oral tradition) will stuff my innards (go down with me at my death): considering also those unstable adventures surely coming into play; and that the whole is reigned over and governed by the power of incalculable God, inspiring us not by Bacchanalian abandon nor by delirious stirrings but through astronomical assertions. An assertion can be a testimonial or a deposition. If it were Divine then that would be quite a thing. But it is such a vague term that it can include an act which is evidenced by the fact of the matter, by a given circularity. Nostradame is quoting Giovanni Pontano (d.1503) Secretary of State for Naples. This is from his commentary on the first proposition in pseudo-Ptolemy’s Centiloquio. He also wrote a commentary upon De rebus coelestibus and was a strong defender of astrology at a time when sciences were first challenging its postulates. Pontano drew alongside Bonincontri as the greatest of the Italian astrological poets of that era. Damn is from OF out of the Latin damnare (actually *damum meaning damage or loss, a Latin-French legal expression back to the Fourteenth Century or before) and can mean to sentence someone or otherwise bring on their ruination. It could also function as a miffed response. that which in those centuries to come they could have understood the origins of, and could relate that desired existence to past experiences. Also, be sentient to this maxim of the true Saviour. Nolite sanctum dare canibus, nec mittatis margaritas ante porcos, ne conculcent pedibus et conversi dirumpant vos. France was early to print vernacular Bible editions (at least 18 before 1555) making specific quotes widely checkable. Generally, though, Michel Nostredame does not transmit his quotations (not all of which are disclosed as such) fully accurately. By chance? For a reason? Of course, handwritten books were expensive and rare hence anything not yet in the print market was no great problem regarding plagiarism or inaccurate quotations (if such concerns troubled authors at all in the mid-Sixteenth Century). The text word ‘genius’ represents not so much the abstract Roman meaning as that classical-pagan superstition-tradition which endures to this day; a guardian spirit or personal angel. Translation note: the unusual ‘buon’, may be from the OF verb ‘buer’, giving off misty vapours. this warmth and power of prophecy approaches us: as it occurs to us with rays of sunshine, which come transferring their influence into the elementary bodies and the non-elementary. Nostredame seems made aware that all substantial life comes initially from the Sun in the form of daily sunshine – the basic sugars and evolved fats, proteins, vitamins mostly started their existence on Earth with the magical transfer of sunlight into a green leaf. He is also cognizant of elements and compounds, as befits any student of pharmacy, alchemy or the old texts. Is prophecy injected by an inexplicable form of photosynthesis, as sunshine penetrates the skin, or did it simply feel that way to Michel Nostredame? The gist here may be that a fully-fledged Prophet of the Great God must trump some seer inspired to entheazein by the demi-gods. as a Prophet proper, my son, is that one who sees things in places far away from the natural cognizance of any creature. Translation note: although ‘cas’ has its rare but persistent forms (it appeared as ‘gender’ in 1544) in the phrase ‘cas advenant’, appearing in the following section, it is the latter word that carries the prevalent meaning, although it doesn’t help that these two words could each mean ‘event’. Let ‘cas’ be read as ‘circumstances’. And in the circumstances of this event that the Prophet inter-mediates with the help of the perfecting light of prophecy he appears manifestly of those things divine, though as a human being he could not make such power, with the intention that the impacts of the future prediction reach far. This resembles a truism of an internal condition usually concealed by the participant (I’m thinking of a recognisably similar state but not of prophecy so-called, of which I have only tangential experience) in that increasing one’s virtuous behaviours in the world and in the heart and mind enables better efficacy in the private, personal and extraordinary enhancements of the Self. Mysteriously, the two gains – a growing virtuousness and an increasing proximity to the Source – edge each other forward by incremental stages. It is not usually voiced because there are no adequate words available to describe all this accurately to those who do not currently participate but a stricter application of truthfulness seems to be its strong by-product. grasping their proximity to the source, the generous arbitrator, makes apparent those cases for which they were not strong enough in their self to gain that immediate knowing of the existential engagings, not through the popular superstitions nor by logical equivalences or a masked righteousness, all of which are inferior to the hollow dome of the one Heaven (that contains all), in fact existant in all eternity which will ever come to embrace us within the self. Rather, the cases of celestial movement are engagings through a Herculean concomitant churning towards some indivisible eternity. Eternity is definitively indivisible whilst the Solar System is operated by punctuality and therefore all in it is doomed to come to an end (“Saturn eats his children”) whereupon it must give place to Eternity again. About the widely misread “comitiale agitation Hiraclienne”: on its own the technical term ‘comitiale’ refers to a plotted scale such as is used in portrayal of the ecliptic or the celestial equator whereas ‘maladie comitiale’ would refer to epilepsy. It suits the robust vigour of the stars to interpret ‘agitation Hiraclienne’ as the familiar ‘Herculean’. But I would like at this juncture to make mention of a lesser candidate, Heraclitus of Ephesus (Fifth Century BC) who saw himself as purely self-taught, a pioneer of philosophy which he approached by way of riddles. People called him ‘The Obscure’. Sounds familiar? His beliefs included the perpetuity of change (a major Asian doctrine also) and the inclusivity of opposites (as in, say, white includes a growing blackness and black a growing whiteness). He also held that fire was the supreme element and Nostredame seems to concur (and yet the element of water is inextinguishable). For Michel this belief may have been reinforced by the book of Revelation. Prior to state-enforcement of Christianity this religion was essentially a water worship that later became heavily adorned with symbols of Mithraism, the Rome-embraced fire worship of the Sun. Heraclites once said“all things come to be in accordance with this Logos” which is near-identical to “In the beginning was the Word” this being the usual biblical vernacular for the loose Greek term ‘logos’, λόγος. ‘Principle’, ‘Thought’ and ‘Account’ are just three of several equally good candidates for ‘logos’. And it had yet another, augmented, meaning to the Judeans back in the day of John’s Gospel: it confirmed Jesus as an incarnation of the original Cosmic Mediator who came to make true the transition between the bad old and the good new. Nostredame throws himself into the debate that preceded the Age of Reason, the results of which have elevated for a season the scientific method and the social computing paradigms. OF ‘celle’ could be ‘that’ or it means a monastic cell, a closed space to meditate without interruption. I’ve no idea of the original intention here and so I’ve opted for glancing references to both. requiring that any prophetic inspiration one receives is taking as its first principle the driving force of God the Creator, then the Now and Nature. When the meditator is a still silent fortress, sealed without against exterior incursions and guarded within against interior diversions, he or she enters the Now Everlasting. How would that end? Naturally, like first waking in the morning, something which is not directly controlled by the mind shall break this circumstance slowly and gently, yet not willfully, and we return into punctual time – present, past and future. By which testing way of being the indifferent cases are indifferently produced, not produced, and his presage starts to occur or he will already have predicted-prophecized. I think by ‘indifference’ is meant the expression ‘All is One’, i.e. not differentiated or separated-out, as we will by then have reached a state of sensory silence and gone beyond the usual interactivity. To get to this state requires no requiring; it is ambitionless yet it tests and yet to succeed one must eventually make no efforts. It is the most difficult of things to achieve and the lightest of weights to carry. The initial causes for gravity and light, not to mention figuring-out the mechanics of human chronothesia – mental time travel – remain largely unsolved mysteries. Returning to the source is a path on which few entrants will reach completion. (Yet we all have done so or will try soon enough). It is like a scaffolding around a tall building. There is a ladder from each level’s platform up to the next. All it needs is for you to go from ladder to ladder until you reach the view from the top, and yet most will explore the intermedian levels. These storeys include widows of opportunity for enhanced ability at magic, fortune-telling, astrology, the psychic gifts, dowsing and all those other transfixing powers. Once fascinated the climber will be grounded to that platform by an empowered enthusiasm and most probably will not be bothered about reaching the top, so absorbed has he or she become. In more worldly matters it is often the one who lingers at length to learn his skills thoroughly and then sticks to his last for a lifetime who obtains worldly rewards. But on returning to the source one must first overcome all we have ever been taught, so as to get onto this ladder, and then push past many diverting absorptions whilst never letting anything get its hooks into us or sometimes unhooking rapidly as we go. Nostredame was a skilled exponent of the medical and divinatory arts who died as a landed, wealthy, settled and famous man. For that alone, he may wish to return to try again. Jesus said that anyone who would save his life will lose his life, meaning trust only in God for everything and do so unconditionally. Overcome ambition (your own and others for you) and expect to dislike this worldly existence to a marked degree as many folk, especially in congregation, will neither comprehend your life actions nor appreciate any apparent lack of them. And also my son, I entreat you please that you never employ your understanding to those reveries and conceits which desiccate the body and put the soul into perdition, spreading disorder to the weakened senses: the same for the vanity of the most execrable magic, particularly disapproved of by the sacred scriptures and the divine decrees at the head whereof, apart from the judgment upon Judicial Astrology: by the which, and realizing inspiration and divine revelation throughout our continuing computations, they have written down our prophecies. And as much as this mystical Philosophy was not rejected, they have at no time desired to present their own unbridled convictions, so much that several volumes which were hidden long through the centuries were made evident to me. But rather, questioning what could happen, I upgraded my knowledge thereof by perusal of these and afterwards gifted them to Vulcan the which god however came to devour them greedily, the incandescence rose into the air rendering a strange clearness, more clear than that of a natural blaze, like the fiery luminescence of claw lightning, illumination going all around the house as if it were suffering through fire. As if for this to occur was not staggering enough, thoroughly examining that perfect transformation, as much of the Moon as of the Sun and molten precious metals, these had by mystical waves changed to ashes. If this is a true account then the waves are descriptive but if this is an analogy then perhaps waveforms were known somehow to Nostredame, made possible by seeing way into the scientific future. In a religious fable of St. Dominic and his historic mission of 1203 to reclaim the ‘Albigensians’ or Cathars, the case was deemed proven when their conflicting texts were each cast into the fire and Saint Dominic’s alone resisted the flames. Anaxagoras (whose lifetime was in the era of the Buddha and Confucius) once described the Sun as a blazing metal mass. It certainly has plenty of iron, as ‘green’ space photography demonstrates. This is as good a juncture as any to mention the web essay ‘Planets, Colors and Metals’ by Dr. Patrice Guinard, translated by Matyas Becvarov. Antique astrological land registers had been compiled including by Ptolemy (his ‘Tetrabiblos’). It is thought that Nostredame used a particular manual to direct his visions by astrological computation to place-names and geographical references. But how accurate was it? Hidden in plain sight? So exactly who is his son, this Cesar? Ostensibly here was a newborn babe that could comprehend the strangest things. ‘Aligning my senses with the Heavens’ is, perhaps, the one best boast of any true astrologer. Surprisingly, Michel Nostredame the Visionary is not claiming this for hisself. His devotion to a more divine sort of Astrology may have stemmed from a modest self-appraisal. than my feet with the ground. (If I should say) ‘It is not possible that I fail, err or be deceived.’ (Possum not errare, falli, decipi) I am sinning more greatly than no other in this world and subject to all the human afflictions. Lymphs are specific ducts and nodes that carry lymph fluid in the human body. “There are two glands on either side near the junction of the seventh rib” Gray’s Anatomy. Michel Nostredame died of the affliction gout. The pain of gout is linked to acids and the lymphic drainage system. Cesar his son is newborn. In the embryonic ‘lung anlage’ the first lymph nodes form after the seventh month. The Latin ‘lymphaticus’ denotes one who is in a delirium. The ‘seventh’ may refer to the seventh planet, seventh age or seventh millennium or the human epitome of all of these, the Saturn-induced approach of old age. Yet not every quatrain reads astrologically or houses astronomical references: his intuitions and his visionary knowings appear to drive a great many of them. As far as we can tell, the ten Centuries came piecemeal and did not reach the thousand quatrains he envisaged (and yet he hints in the Epistle to the King that he might even have exceeded that sum at first). the which I have desired to join up a little obscurely: and are perpetual vaticinations, for from now up to the year ‘3797’. We cannot tell but most will assume that this is 3797AD although I sometimes view it as an unexplained yet special entry, not quite a red-herring. Curiously, it compares to the Hillel World Era Hebrew Calendar (following the Septuagint) that started the World from October 7th 3761BC and which had become well-known by the Late Middle Ages. In fact the difference between these BC and AD totals is just 36 years. Could this represent the lifespan of Jesus with 3761 years of the Earthly duration balanced on either side of the outstretched arms of His Earthly presence? I guess that Nostredame used the word ‘perpetual’ here because he had already confused the order of quatrains in the Centuries and so could not sensibly say ‘sequential’. In his lifetime he was sometimes abused by other authors, especially for claiming ‘perpetual vaticinations’ which expression seemed to anger his critics who perhaps interpreted this as meaning cyclical predictions. Nostradamus Quatrain IV 31 also speaks of the ‘brain’ of the Moon. and this is understood universally by all the planets/grounds of influence, my son. The light from the Moon strikes upon the concave rear of the inner eye, where it is received as vision by the sensitive cells, and this connects almost immediately with the brain rightway behind it, brain being the seat but not the scope of the Mind as it channels its illuminatory periscope, the Heart. Anaxagoras in the Fifth Century BC observed that the Moon’s shine is reflected light from the Sun and believed that the Moon was inhabited. If you live for the normal human span, you will see in your climatic zone, under the appropriate skies of your nativity, these future adventures that are envisaged. Baby son Cesar was born in the South of France in the Sixteenth Century, ostensibly delimiting the scope of his father’s prophecy. Seemingly it all occurs before he reaches the Biblical “three score years and ten”. Otherwise who is this ‘caesar’ and in what era? Much as the one God eternal is the only one who can understand concomitantly the eternality of his light proceding out of Hisself, and I say that quite frankly; there are those to who his unbounded greatness, which is without measure and incomprehensible, and by lengthy melancholic inducements being entreated to reveal, that with the aid mentioned hereunto hath divinely caused mystic manifestations, mainly by two principal cases which conform to the understanding of the one inspired who prophesizes, (1) the ones suddenly infused clarifyingly by the supernatural illumination, in the person of an Astrologer, and prophesizes through inspirational revelation, the which is a certain participation in the divine eternity, (2) the way by which the Prophet comes to judge that which his divine spirit, had given him by means of God the Creator and by the usual instigation: this is so as to know that what is predicted is true and taken from the source aetherially: and such light and the small flame are altogether efficacious, and of a level not less than that of normal clarity and normal illumination rendering the Philosopher/adept so assured that, with the aid coming from the principles of the First Cause, lofty doctrines have obtained over the profoundly abysmal. A clear statement this; here is a way to judge whether an ensuing course is good (up) or bad (down) by checking the measure of light given off. Its brightness, sparkle and clarity must rise above the normal level as the falling-off below that norm would be a very bad sign. This seems similar to the brief joyous experience – often referred to as the spirit of Kundalini – that shivers up the spine in a travelling frisson and out through the ‘hollow crown’ on the top of the head (some mixed metaphysics here). If some negativity is at play it will travel downward from the base of the spine and not upward (but a person in control of their self can turn it back upwards again). Ana-gogy is up:kata-strophe is down. (The lunar North Node or Caput Draconis was sometimes called the Anabibazon: the South Node or Cauda Draconis was also called the Katabibazon or in Hindu the Ketu). This cannot be Peri the Persian Fairy nor, as a negative, does it seem like ‘peri’ as in perished so it must be ‘peri’ as in “up periscope to find unbroken footfall”. meaning inclined to go walk about. A Greek-Roman peristyle is, in effect, a covered walkway all around a building created by classical columns supporting the perimeter. The “last conflagration” of Revelation is in Chapter 20, verses 14-15, “and the death and the hades were cast to the lake of the fire – this the second death; and if any one was not found written in the scroll of the life, he was cast to the lake of the fire.” (Youngs Literal Translation Bible) Apparently an appropriate astrological alignment has been calculated by knowledgeable T.W.M.Berkel as having happened on February 27, 1554. Otherwise, it’s due sometime over on the wrong side of ‘3797’. because even as the planet Mars finishes its time at the end of its last turn so it will take it again: furthermore, grouping in a body the ones of Aquarius over several years and the others in Cancer for much longer and continuously. Astrology was an educated pursuit and over 150 pamphlets circulated portending the Second Great Deluge and all this at a time of mortal pestilences and severe breakdowns of social order. There had long been a debate between Augustinians and Aristotelians about which came first, the celestial sign urging the Earthly change or the Earthly circumstance causing the heavens to signal it; although they should occur simultaneously in theory. Michel Nostredame writes as if siding with the Augustinians who by some ‘circumvenient’ argument had forged Divine intent into the aforeseen outcomes of starry movements – the Sun Sign interpretations of which can only lead us straight back to the counter-significance of human free will. The ways of the old country of Aragon are called ‘Aragon-ais’ (French) or ‘Araragon-ese’ (Italian). Cutting deeper into the head and removing the tail of anaragonique would leave ‘ragon’, a family name which is also an anagram of noble argon (Greek ‘argos’ = inert) used today to make incandescent lights, but perhaps too usefully containing to be suitable for a revolution. It’s suggested that the ancient Greek ‘agon’ (pl. ‘agones’) fits after ‘anar-‘ here. This was rather literary and implied a formal competition for a set prize or a comic debate. The sequence ‘proagon/agon/parabasis’ gives us protagonist and antagonist (as well as agonize). A small similarity exists between ‘agon’ and ‘archon’. But if we accept the Greek prefix ‘Ana-‘ here then there is still the throated consonant ‘r’ to explain away. The prefix ‘ana-’ can be derived from an ancient Greek preposition indicating ‘up from’, as in spiritual regeneration or some other form of increase (whilst OF ‘anar’ is Old Occitan for ‘going in’ and OF ‘razo’ is Old Occitan for reason, argument). ‘Anaretic’ is a term currently used by Astrologers for the ’29th Degree’. Actually it refers to a planet or body positioned anywhere from 29°00’00” to 29°59’59”. Ana-dragonique? Nostredame used repeatedly the Dragon’s Head of Draco Constellation as a reference for his astral plottings. 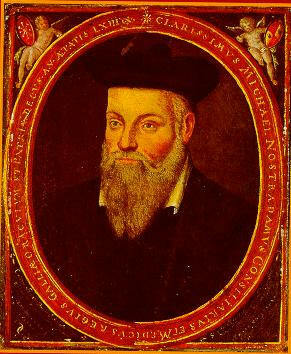 An alternative tack has been taken by Nostradamus researcher T.P.Pinet of Canada who echoes a Rigaud Edition by stating that the word is anaxagorique after Anaxagoras (d.428 BC) because of some fondness of his for the notion of hot stones originating on Earth and ignited in Space by their own rotation. Well, Astrology is nothing else if not a theory of returns, big time, and an ‘anaxagoric revolution’ might describe the return of hot stones as pulverizing meteorite showers. Otherwise, this could well be whenever some significant sight is due to appear ‘up from the Dragon’. Or this revolution is the last day, the last hours at the End of our World. 177 years is 6 orbits of Saturn, a ‘half year’ by some reckoning, but otherwise I’m lost for something substantial to say about it. This is a most exact timing for some pictured event but my counting from, say, 1553 or 4 or whenever he wrote this, seems pointless. (Or else history has the records of a notable event missing from its libraries.) So we must count-up from the time of the ‘anaragonic revolution’, though would that be “at present as I write this”? Nostredame purports to have originally written sequential-perpetual vaticinations implying process, progression and streaming through fixed ports in time i.e. not so variable on its dates as, say, the Chinese I Ching’s mutable predictions are. Taking ‘perpetual’ to mean ‘cyclical’ then this would tend to shackle Astrology’s claim of predictive accuracy to its lack of manoueverability around a fixed time. If we check against the Epistle to the King we find an equally obscure reference to “73 years 7 months” which has two of the same odd numerals. Perhaps these numbers have a meaning that is quite separate from the sentence? It is quite possible that Nostredame’s sequence of the thousand-year planetary rulers was that of Roussat following ibn Ezra. Michel does not say, but in that particular scheme each planet had its sphere of Longitude excepting the eighth sphere which was that of the stars and so was expansive in Latitude. The textual use of ‘hors mis’ is awkward to contextualize here whereas another expression ‘hors tout’ (meaning around the greater dimensions of the surrounded construction) would fit nicely to a superior movement enclosing a system of motion and accurately restricting its inner section to a stable course. Well, after serving us up a word like ‘anaragonic’, who knows how far we are meant to go to satisfy our research? The Prophet Mohammed PBUH declared hisself the last Prophet. His secretarial records of the dictated words of Allah have been examined and discussed over the ages. The subsequent hadiths are precedental and require earnest comparative study much like English Common Law (its precepts probably having been Arabian and imported by returning Crusaders). The Hebrew Rabbis are also pleased to debate comparative points of view. By contrast, the Sixteenth Century Catholic Church simply imposed itself by Papal dicta, or Bulls, and an extensive top-down network of controls. In Nostredame’s lifetime, Muslim invaders reached the outskirts of Vienna where they were defeated by King Jan of Poland to the huge relief of all Europe wherein they were the bogeymen of that age. Griping or even some ridiculing at their expense would have seemed rather agreeable at the time, I’m sure. Translation note: Although there are scores of texts that speak about, say, the “Loy Machometique” and the fact that ‘Machomet’ is a known transliteration like ‘Muhammad’ (found in Roussat) or Mahound (Rabelais) or the inspirational ‘Machometus’ as employed by Medieval Latin authors (the Greek source being machomenôs, macho conflict, rather more perjorative) by associating it with dreams Michel could have meant regular – and regularly confounding – night dreams as opposed to visions or daydreams. also at no time did God the Creator by the ministeries of his messengers of fire, in flaming despatches, come to set something before the external senses, so our eyes, in the cases of future prediction, (but only by) the significations of the future case to the augur who must dutifully manifest the auspice. God, the only infallible judge, perscrutates both the prophetic intermediary and the other players alike, scrutinizing all. Nostredame’s ‘outside light’ is either spooky or deeply spiritual or a very sophisticated physics notion indeed. DNA is found to a far greater extent than just within the human body, as complex as that is. DNA reaches 2-metres long by only 10-atoms wide. It lives densely coiled and wriggling in the waters of a nucleus, emitting photons in the range of visible light. Powerful evidence has emerged that the body’s cells transmit light messages for each other to receive, perhaps even pre-scheduling a living body’s impending termination. As fixed as we might wish DNA to be, genetic changes have been traced as a result of childhood trauma. DNA has been advanced as possibly the centre of a geneticized neuro-consciousness that literally shines with energetic information. Einstein’s speed of light in vacuum is as theoretical as the perfect vacuum is and all real measurements must include the propagating effect of the medium. Any inertial observer is said to register the ‘local speed of light’ as 299792.458km/s for all directions but a distant retreating light may register as faster whilst distant oncoming light will register as slower. Though the norm for us is the speed of local light, some movements can seemingly exceed this ‘maximum speed limit’ including certain shadow movements that seemingly travel over shaped surfaces faster than the light source moves. In Nostredame’s time they assumed that light was virtually instant and never thought about measuring its speed. The marine microorganismNoctiluca scintillanssometimes blooms in a brilliant way at night causing water to glow with a blue light. Electrons propagated in water at speeds faster than the local speed of light are now thought responsible for ‘Cerenkov blue light’ that may be seen, for example, in the surprisingly basic cooling pools used for nuclear reactors. Michel likely stared into a bowl of water as part of his preparations. Michel Nostredame, master of mystery, is here describing the indescribable; the flames and light are a fantasia coming about from proximity to what is beyond our human ability to understand, let alone convey, being non-abstracted at source. I feel that something of the working of the human brain is revealed by our routine cancellation of the blind spots on the concave areas of the eyeballs. This is done by sampling the viewed scene around the blind spots and filling-in our brain-picture accordingly. It is my suspicion that on encountering whatever it has no facility for or faculty at, the mind-brain will substitute any image that comes vaguely close to what should be there; an imaginary visual filler. This will likely be in error but the deluded sense of continuity of perception will be sustained, as it has been all through every person’s lifetime. The imagination sources this image immediately and then manipulates it. What else is imagination capable of? There could be much more, so it may be wisest to make void whatever was imagined in playful folly but is unwanted ‘in reality’. the reason is far too obvious, the whole to be predicted through elevatory exertions of the divine nature and through the medium of the Angelic spirit inspiring people to prophesize, rendering them anointed with illumination from the vaticinations, performing/moving before the fantasia through divers nocturnal visions that by diurnal certainty prophesize through Astronomic directions conjoined with the sanctified future prediction, with an unlimited courage that is unthought of elsewhere. Come at this very hour to understand, my son, that I find by my revolutions (analyses of planetary returns), which are in accordance with inspired revelation, that the sword of death approaches us now, through pestilence, war such that the (accumulated) lifetimes of three men have not seen more horrible, also famine, that which falls to ground, and will frequently return there: because the Stars passing through their cycles precurse it, and also it is said: ‘I will visit their iniquities with a rod of iron, and will strike them with blows’ (Visitabo in virga ferrea iniquitates eorum, and verberibus percutiam eos), because the mercy of God will not be dispensed for a time, my son, that the most part of my Prophecies will be achieved, and will come to be through the completion of heavenly movements. Nostredame speaks here only as an observer of the God-willed future, despite using the possessive case. Most modern astrologers would not go so far as to link the planetary movements with such inevitabilty and yet descriptions of End Time always seem to be of the special case that the force majeure attributed to massed human will has gone AWOL. The fragmented Latin quotation employed here is, in full, ‘conteram ergo et confringam et non miserebor’ meaning ‘I will trample them and break them and not show pity’. OF-Latin ‘oratio’ and ‘prosa’ both mean suitably freed-up; straightforward; sans poésie; with ‘ōrātiō’ limited to speech. Roman society placed a lofty emphasis upon oratory powers, i.e. on that persuasive speech-making that is free of the constraints of verse, empty of call-and-response except as a climactic emphasis (with heckling being attempts to bring down the gallop of an unswerving speech) and is as inventively free, within accepted limits, as any performance art intended to captivate and divert us from our doubts. So this is not the Centuries nor the periodical presages. Probably not his book on jams, cosmetics and medications either. Perhaps the Almanachs, the Epistle to the King or some work that may have become lost to us today. the case will be more illuminated by then. Here’s exactly how I feel the Centuries were intended to be. They make for a good guessing-game but that was not the prime motive. Following the Biblical tradition of Prophecy, these predictions will only come clear after the event as a matter of deliberate policy on the part of the Prophet. Yet in the present case of Nostradamus, that is true excepting in the hands of one person … maybe that person is you? To conclude, my son, take thus this gift of your father Michel Nostradamus, hoping thou to declare each and every Prophecy of the quatrains. Praying that immortal God pleases to attribute long life to you in good and prosperous well-being. De Salon ce 1. de Mars 1555. I am hopeful that I shall not appear pretentious … but … I too dedicate this translation and its accompanying commentaries to the hoped for ‘Son of Nostradamus’. It is noticeable that Michel Nostredame has reverted in the second half of this astonishing letter to what was probably the most acceptable (yet barely coherent) account of his prophesizing that he could muster for the Church’s literary Censor to dwell upon. For instance, it is not always crystal clear that the intermediary involved is the prophesizer visited with the ‘perfecting light of prophecy’ and not some ‘heavenly mediator’ as ‘generous arbitrator’ in trine with the Source and the ‘external light’. which St.Peter advised was the intended meaning of the prophet Joel, i.e. popular prophecy as the Word of God. Nostredame quotes Joel directly on this in Epistle to the King. But why should God work through the agency of mere mortals? Perhaps because God, whilst doubtless understanding perfectly each nuance of language and thought, is a non-verbal essence much superior to our comparatively unintelligent verbal inventions with their vague inaccuracies and built-in pitfalls and paradoxes. In my view He never evinces “the 3 R’s”. Congregational religion, on the other hand, is essentially an abstraction industry whereby all personal relationships with God may be trumped by a clerical emphasis upon collectivized and not unprofitable ‘pronunciamento’. All the prophets of the Bible were careful about treading upon the announcements of the priests but scathing to a man about their placing the Law before the Spirit of God that lives freely within and without us all. Over many years experience working with street-children it was ever clear to me that there subsisted two distinct types of homeless group. Both formed supportive communities: the street scavenger groups living peacefully together as individuals and without any leaders at all and those gangs of market hustlers living under a hierarchical structure with the most violent on top. Yet which one to belong to was not so much a choice as an accident of the perambulations taken after a lost and lonely child’s arrival at a strange city terminus. Even for these disparate crews of abandoned mites, leadership is clearly not as essential as we were all taught by those whose living depended upon it, for Love-and-Truth is ever with us internally and shall reappear externally as we go, God willing. We have no real need to toast our fairweather friends in high social places – anybody can be somebody else’s supplicant – as it seems overwhelmingly human and true that we are all as important or as unimportant as each other as each of us tilts toward our own uniquely punctuated flightpath to the common landing zone beyond.